This April 23, 2018, file photo shows Britain's Prince George and Princess Charlotte arrive with their father at the Lindo wing at St Mary's Hospital in London where their mother, the Duchess of Cambridge, gave birth to a healthy baby boy. 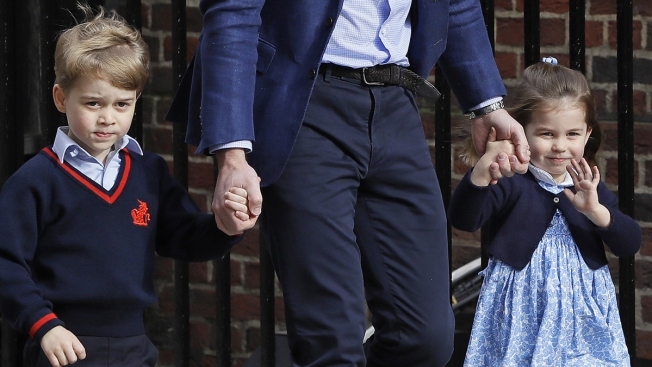 Kensington Palace said Wednesday, May 16, 2018, that four-year-old George will be a page boy and three-year-old Charlotte will be a bridesmaid at the wedding of Prince Harry and Meghan Markle on Saturday. Britain's Prince George and Princess Charlotte are officially taking part in their uncle's wedding on Saturday. Kensington Palace announced Wednesday that they will be in Prince Harry and Meghan Markle's wedding party as a page boy and a bridesmaid. George, 4, and Charlotte, 3, the first two children of the Duke and Duchess of Cambridge William and Kate, had the same roles at their aunt Pippa Middleton's wedding last year. They welcomed a little brother, Prince Louis, last month. The list of bridesmaids and page boys announced Wednesday also includes several godchildren of Harry and Markle. The 10 children are as young as 2 and as old as 7. Kensington Palace didn't reveal what the wedding party would be wearing on Saturday. Here is the full list of children, with their age listed on the day of the wedding. The birth of the third child of Prince William and the Duchess of Cambridge prompted celebrations across the country. Master Jasper Dyer, 6, godson of Prince Harry and son of Amanda Dyer and Mark Dyer M.V.O.